Twenty years ago, my dad taught me how to change a car tire. That's Part 1 of this story. 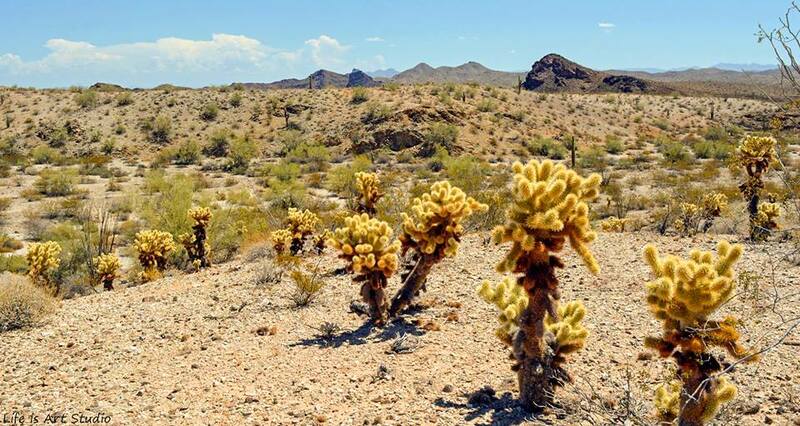 Part 2 was late last month, when I used that knowledge for the first time — and learned some valuable lessons about traveling in Arizona's less-visited areas during the hot summer months. As I've written on our blog before, my job at Arizona Highways takes me to some interesting places. On a recent assignment, I was in Western Arizona, checking out something for an issue of the magazine that you'll read later this year. And when I say Western Arizona, I mean Western — about two and a half hours northwest of Phoenix, to be exact. My destination was at the end of a 25-mile dirt road that started smooth and wide, then got rough and narrow. Then it got rougher and narrower. Then it started going over some hills. Then those hills became more like ... well, mountains. But I made it without much trouble, got what I needed and started the drive back to the Valley. About 5 miles into my return trip, it happened. A strange chime, and a flashing orange light on the dashboard. And a message on the dashboard screen: "Low Tire Pressure." I should mention at this point that I was driving an Arizona Department of Transportation vehicle, which we often do at the magazine — you might not know this, but Arizona Highways is a division of ADOT. So all these stimuli were unfamiliar to me, but it wasn't hard to figure out what had happened: I hit something, probably a sharp rock, and punctured a tire. My brain started rationalizing: Maybe it's a slow leak and you can make it back to civilization. I got to a flat part of the road and opened the door. Hissssssssss. I could feel the air rushing out of the tire, which confirmed that I wasn't going much farther on it. At this point, I should set the scene. I was 20 miles from pavement, on a road that literally has only one destination: a place most sane people don't visit during the summer. I had zero cellphone service; in fact, I'd noticed that my signal had disappeared shortly after I'd gotten on the dirt road. I was in an unfamiliar car, and I wasn't sure how well the emergency jack would work on dirt. Oh, and did I mention that the car's temperature gauge read 114 degrees when I stopped? In short, if I didn't get the spare tire on the car, I was going to be there awhile. I knew this, and I'm pretty proud of myself for not panicking. Not when I couldn't find the lug wrench (it was attached to the jack). Not when I couldn't get the lug nuts off (I finally got them to budge with a good kick on the wrench). And not when I started jacking up the car and the jack dug ever so slightly into the dirt (it ended up working just fine). Once I got the spare on, I had to nurse the car another 20 miles back to the paved road with no further margin for error. Thankfully, I made it without more trouble, and my day trip ended with me at home on my couch, rather than rationing water in the Sonoran Desert. I told my dad about it later. "Not panicking is half the battle," he said. So that was one thing I did right. The other: I told my wife where I was going and when she could expect me back. If I hadn't come home that night, she would have known something was wrong and been able to give the authorities a general idea of where I was. In all likelihood, I would have survived, even if the tire change had gone awry. But I could have done some other things differently. For one, I didn't take enough water — because I didn't think I'd need it, because I wouldn't be out there long. But you never really know how long you'll be out there, do you? It also would have been wise to travel with someone — a friend, a co-worker, whomever. That person might not have been much help in this situation, but two people usually make better decisions than one person does. And if your traveling companion has a different cellphone provider, maybe he or she will be able to get a signal when you can't. Finally, I should have filled up the gas tank before hitting the dirt road. I had about half a tank when the tire blew, but a full tank would have bought me some more air conditioning time in the event I got stuck out there. I guess the best way to put this is that even though I made it out of this situation fine, I'd give myself a C-plus, at best. And in some situations, that wouldn't have been good enough. I'm learning from my mistakes, though. As I'm writing this, I'm out on another assignment, this one in Southern Arizona. It's still hot, and I'm still bumping over dirt roads with rocks jutting out of them. But this time, I'm keeping the gas tank full. And taking more water than I normally drink in a week. Thankfully life allows us to learn lessons without killing us. Looking back on what could have been worse helps us prepare better the next time. I have foolishly explored dirt way further than I should have. Great blog and good reminders.